As woodworkers it can be pretty easy to shop for us, since there is always another new tool we would like to have in the shop. The holidays coming up are providing many opportunities to increase the number and/or quality of those tools in our shops, and now is a perfect time to write up our wish lists so our family and friends will know exactly which tools to get us! Curtis Turner wrote up his wish list below – take a look! 1. 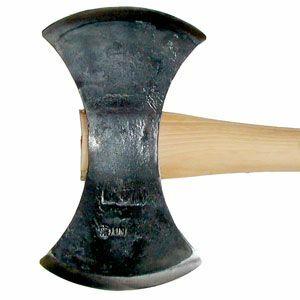 Gransfors Bruks competition throwing axe – I have participated in several friendly axe throwing events and they are a blast. Do I need one? Well, not really but they are just so cool. 2. The complete collection of Roy Underhill DVDs – I have watched the Woodwright’s Shop for decades and have always been amazed at Roy’s knowledge and enthusiasm for the craft. 3. Easy Wood hollower #3 – I think this may be just the tool I need to improve the surface of those hard to reach places in my hollow forms. 4. Auriou rasp #10 9″ – I have seen Michel hand stitch raps. I admire his dedication to this ancient skill. These rasps work wonders at shaping wood. 5. Foredom Angle grinder – This would be a fantastic accessory for my Foredom TX flex shaft. Curtis is 2012 President of Central Texas Woodturners, a member of the American Association of Woodturners, and a member of Fine Woodworkers of Austin. Curtis teaches and demonstrates nationally for Lie-Nielsen Toolworks. He also owns a studio where he teaches and works. Curtis lives and works in Central Texas with his wife and four young children. Take a look at his website at www.curtisturnerstudio.com. Morton’s Shop: Mortise Crotch Walnut The Highland Woodworker Blog: Still Missing Woodworking in America?